World War I was a defensive war. Troops who went "over the top" of the trenches soon found that an infantry advance against entrenched machine guns was not very successful. Casualties in offensives were outrageously high and usually the result was very little gain. A stalemate soon settled in along the western front which lasted most of the war. What they needed of course was a tank. A Colonel in the British army developed the idea when he noticed that the only vehicles that could navigate the rough terrain were caterpillar tractors with moving treads. He realized that if such a vehicle were covered with armor, it might be just the very thing to get into and over the other side's trenches. He passed the idea along to the government and Winston Churchill, then First Lord of the Admiralty, got it. He was intrigued by the idea and started a project to develop the idea. It was so top secret that the workers were told that they were working on water carriers - naturally, they began to call them "tanks," short for water tanks, and the name stuck. 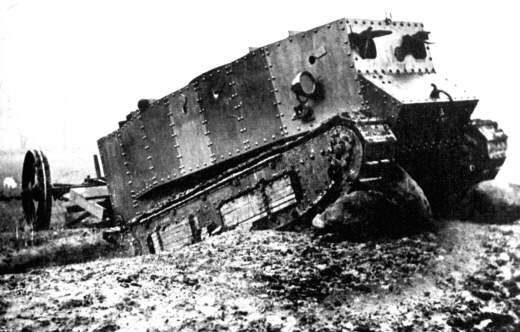 The tanks weren't used in battle until the end of 1916, but then the first batch was tried. Unfortunately most of them broke down before they got very far, but a few did get past the enemy trenches. The army saw the potential and got production underway. A year later, in November of 1917, they were for the first time used effectively to break through the enemy lines.